When you’re strumming those beautiful chords and want the world to hear, you need a special piece of equipment to properly convey it to your listeners. If you’re recording your acoustic guitar sounds, we highly recommend grabbing a condenser microphone. 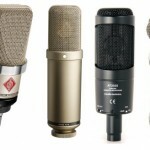 For more info on those, check out our best condenser microphones article. Otherwise, we highlight our favorites specifically for guitar later in the article. On the other hand, if you’re more interested in performing acoustic guitar, a dynamic microphone is preferred, although we’ve seen musicians use both those and condenser mics pretty equally. Let’s get into the details. Your budget. 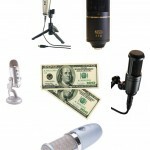 There’s a pretty broad range when it comes to microphones, but there are some decent models at affordable prices. We tried to cover them all. Do you have an audio interface yet? If you purchase a condenser mic, you’ll also need some phantom power, which we recommend buying an audio interface for. Check out our best audio interface article for more info on what these can do and which you should look at. Are you performing or recording? We recommend a condenser microphone for both. 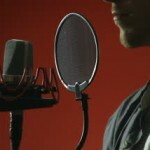 The main difference of performing and recording is microphone positioning. It’s stated to be better for performances for mics to be very close to the guitar because it helps reduce feedback and captures the levels equally. Necessary accessories you’ll need. Some of these come packaged with mic stands, popper stoppers and shock mounts, while others do not. Take this into play if you’re mapping out your budget. 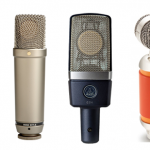 Our first condenser mic listed for acoustic guitars, MXL mics is up there with the best. A lot of reviews around the net praise it for the price-to-quality ratio, so this is our pick for the best microphone for guitar on a budget. It’s pretty sensitive when it comes to pick up and the quality is extremely crisp considering it’s seen for at or below the one hundred retail range. You have a nice metal make with black grill, low distortion, and a custom switchable bass cut and -10 dB pad. The FET preamp inside is of nice quality and is up there in terms of effectiveness. This is a bigger mic than others you may find but that isn’t a bad thing. 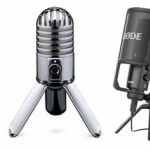 Grab this if you want an affordable, useful microphone that will last you a long time. If you do save up a few more bucks you can grab a better mic with a bit more frequency range and overall sound quality. Blue microphones are becoming more known as they continue to provide extremely high quality audio solutions, not to mention their aesthetics as well. First of all, just take a look at this thing — the vintage, professional look is something to at least take into consideration, especially if you’re having artists and/or friends over to record. I don’t think that should completely convince you to purchase it, but it’s something to think about. In terms of specs, the Spark is great for acoustic guitar with the high response it has as well as overall even frequency distribution in terms of pickup. 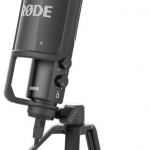 What’s cool is it also comes with a shock mount and metal pop filter if you need those and want to save a few bucks. You get two modes with this model: Normal and focus, with the focus mode creating a more clear and detailed recording if you want to experiment with that. A very professional, clear sounding audio output with this. Grab it if you want a step up from the previously listed mic and care about how your microphone looks, or if you also need a shock and filter (comes with a wood case, too). This is one of the most sensitive mics we’ve known about for quite some time now. It does an excellent job at picking up the higher frequencies for guitars while not becoming drowned out by the lower strings — a nice, even pickup for both recording and performing. A very warm, crisp sound that Rode mics are famous for. A little higher in price but if you’re able to grab this you will be set for an extremely long time when it comes to microphones, not only for recording your acoustic guitar but vocals and others as well — it provides a nice compatibility for a variety of uses. You get a large 1″ capsule with a high quality plated diaphragm (gold) and a wide dynamic recording range. This thing feels like a grenade when it’s in your hands, so you know you’re getting a stable investment that’ll last you quite some time. You may also want to continue down our list however as we include another Rode that’s even better, albeit more expensive. This microphone has been proven to sound well for guitars, both electric and acoustic. We’re huge fans of AKG mics and headphones. Very high quality audio here with a switchable 20dB attenuator and bass-cut filter if you’re looking to switch between live or recording, or merely want to customize the sound in general. The all-metal body is super solid and although with acoustic guitars it doesn’t mean much, it can handle a high sound pressure level (maybe you’re strumming hard — regardless, it won’t distort). It’s a lot more accurate than the cheaper models so you’re getting what pay for. I’ve heard of people using this for rap vocals, guitar cabs, violins, and of course, acoustic guitar. You won’t be disappointed in the sound quality of your guitar with this one. Last but not least, this is one of our favorite condenser microphones in the entire market. The NTK just provides one of the warmest, clearest sounds as compared to most models (besides some Neumann mics). A first of all extremely solid build, a gold plated diaphragm with Class A amp circuitry and a stain nickel finish. This is a multiple year investment. What’s nice is it comes with a power supply, so if you don’t want to buy an audio interface you’re good to go right out of the box (besides some other accessories you may need, such as a stand, etc). One of the widest ranges of mics to give us a present, accurate sound. Perfect for acoustic guitar, and we’d say one of the best microphones for price out there. Grab it if you can, you won’t be disappointed when you strum away.